Ooo-er *Cheat Alert* We just used Aunt Bessies!! Half an onion - chopped. Whether you are making your batter mix from scatch or cheating like us you will need to prepare the mixture first. You can make the batter a good few hours in advance if you like - just store it in the fridge. First, sautee the onion and the chicken in the pan and add the curry powder to taste. Once browned add the garlic and leave on the the hob for a further minute. 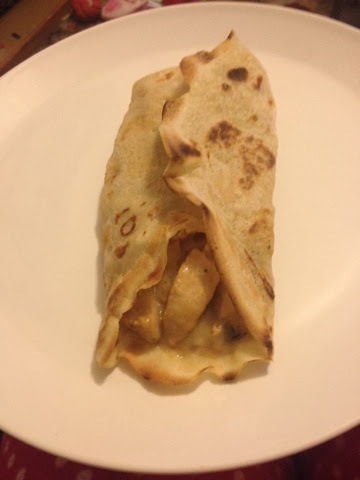 Once cooked through, transfer the chicken, onions and garlic to a plate. Now add the milk, butter and flour to the pan and whisk the mixture as you bring it to the boil. A smooth sauce should begin to form. Simmer for 1 minute, then remove from the heat and stir in your garlic, mushrooms and chicken. Just carefully use the batter to form your pancakes then wrap the mixture and you're all done!! Spectacular Savoury Pancakes!! 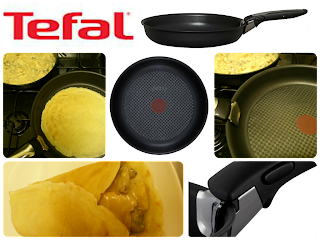 If you love Shrove Tuesday as much as us then make sure you check out the Tefal Pancake Day website and have a go of the Pancake Day selfies app - it’s also filled with tons of great inspiration if you’d like to create something a little more unusual! And if you need anymore inspiration after that then take a look at their Pancake Day Pinboard! Disclosure: I received a free pan to allow me to review and write this post. Pan review to follow.